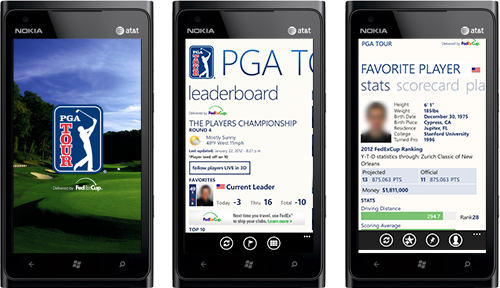 Never miss a shot on the go with the official PGA TOUR app designed and developed by Miomni for Nokia Lumia Windows Phones. 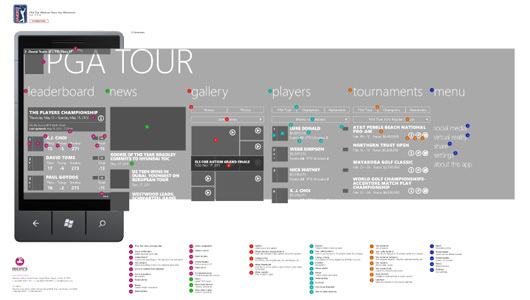 Miomni, in conjunction with PGA TOUR, Microsoft and Nokia, created the official PGA TOUR app packed with a horde of information and data that satisfies the most eager golf fans. The PGA TOUR app provides a live leaderboard for each tournament as well as the live scorecards for each player. The fans can follow their favourite player’s play-by-play from each hole and view his statistics. Live video streams of the tournament keeps you updated with the action on the green wherever you are. This is a must-have app for any serious golf fan. Miomni worked closely with Microsoft to take full advantage of the innovativeness of the Windows Phone Metro OS to its full potential both from the UI design and app functionality perspectives. The Miomni Creative team went through vigorous UX and UI design process to ensure the information is presented in the best possible way and the users can find thier way around in the app with ease using the Windows Phome Metro UI. The app starts with an immersive PGA TOUR panorama screen that users can swipe through key information capturing the events unfolding in the world of golf. From there the user can drill down into individual players or tournaments for more in-depth data. The user journey is clear and intuitive, demonstrating the Metro principal design philosophy. One of the unique features of the Windows Phone OS is the ability to add a “deep-pin” app launcher tile to the start screen. 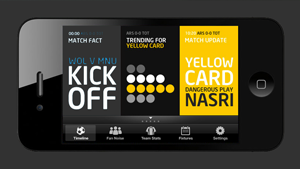 Leveraging this technology, Miomni worked together with Nokia to bring the player deep-pin functionality to the app – the user can place his/her favourite player in the phone’s start screen and check the live score without even launching the app. 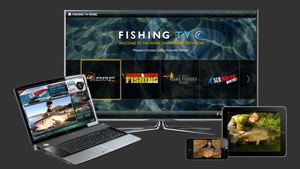 The PGA TOUR app takes full advantage of the Miomni Middleware and Content Delivery Platform. Data feeds from various origins – player data, course data, weather data, ranking data etc – are processed in the Miomni Middleware before being deployed to the app. The video and other media content are managed in the Miomni Asset Management System and delivered through the Global Edge Cache Network to ensure the best user experience. 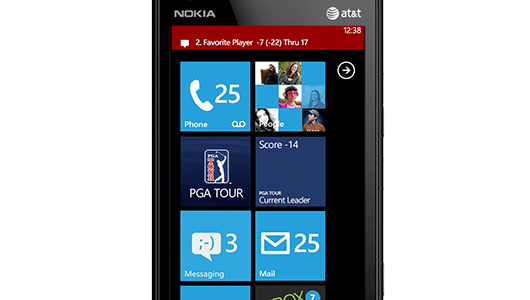 The PGA TOUR app is free and available exclusively to Nokia Lumia Windows phones. To obtain the app go to Nokia Collection in the Marketplace, or use the QR code below.